A sprig of winterberry at Sandra Pond. The tree or shrub sprouts bright red berries this time of year. Winterberry shows festive red these days in Westborough's November wetlands. 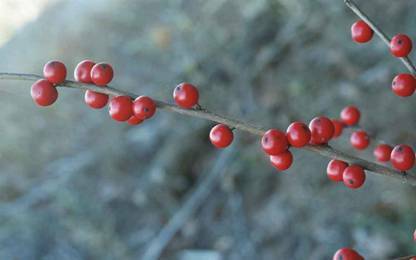 Common winterberry (Ilex verticillata) is a small native tree or shrub that sports bright red berries on its branches in November and well into the winter months. It favors wetlands, so you'll find it growing at the edges of streams and ponds, in swamps, and sometimes at the edges of vernal pools. Black alder is sometimes another name for it. You may notice winterberry while walking in the woods or driving along a wooded road, although it is sensitive to road salt. Sometimes you'll be tipped off by a car that's pulled over on the side of the road near a low, wooded wet area. You might even see the car's occupants returning from the woods with boughs of winterberry for seasonal decorations. Winterberry grows in a few places along the shores of the Westborough Reservoir (Sandra Pond), although the recent trimming and brush-cutting along the shores have made it less apparent--but not for long. Lots of suckers are coming up and bearing fruit, so in a few years winterberry is likely to be much easier to see there. If you follow some of the trails in the Westboro Wildlife Management Area that pass through wooded wet areas, you're likely to see an occasional winterberry putting on its brilliant show. Winterberry is in the holly family, which is not surprising when you consider the red berries. Unlike many hollies, it loses its leaves in the winter. It is sometimes called swamp holly. Like a typical holly, winterberry has male and female flowers mostly on separate plants. Only the female flowers produce berries, and only if there's a male plant nearby for pollination. You probably won't notice the small white flowers when they appear in June. Why do the conspicuous red berries last on the branches? Don't birds and animals eat them? It turns out that the berries do get eaten, but usually not right away. For all their showy brightness, these pea-sized berries are low-quality fruit, with a low fat content. To humans, they have a bitter taste. Birds and animals pass them up in favor of more nutritional food until there's nothing better around. Later in the winter, or during bouts of severe winter weather, the berries will finally disappear into hungry mouths. Sometimes, the berries even last until spring, when they become food for birds that return early to these parts. Native Americans had uses for winterberry, as they did for so many things in nature. The berries were an ingredient in remedies for worms in children. It was the bark, not the berries, that proved most useful to them. They boiled the bark and buds in water and reduced the liquid down. They applied it externally to infected sores and gangrene. They also took it internally for fever, jaundice, and other ailments. For this reason, winterberry was also known as feverbush. A number of commercial varieties of winterberry have been developed. They are available from nurseries for gardening and landscaping. Winterberry is relatively easy to grow in sunny, wet areas. To get the beautiful berries, it's important to purchase one male plant for several female plants.